Here is a single image of what we are calling COO#1. It is part of Family #1. 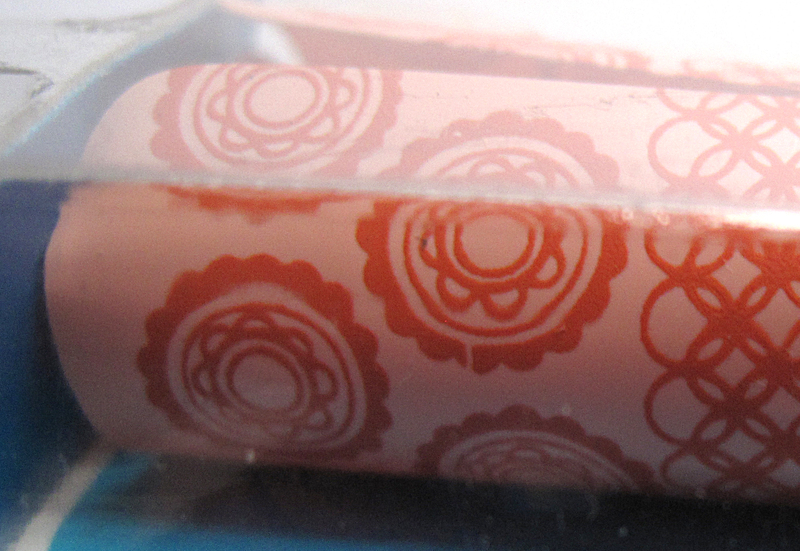 Its key identifying points are that it is a 4 Line , Made In Hong Kong COO Stamp. 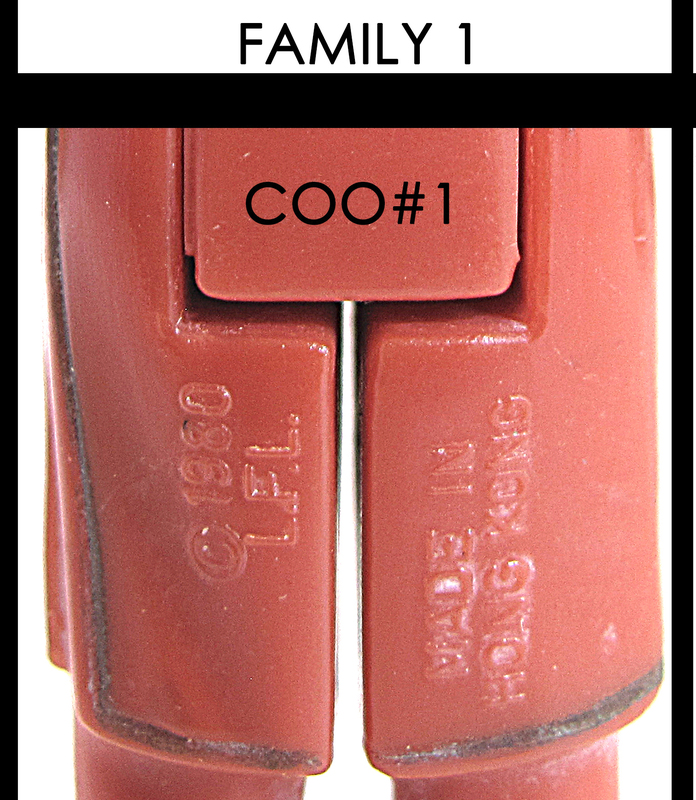 2 Lines of the COO stamp are seen on each leg. This COO is mother to a good portion of the highly desirable and more uncommon and rare variants which you will see detailed below. Since we know that there are at least 2 mold pairs for any figure, there are at least 4 combinations of the stamp that could exist on figures out there. 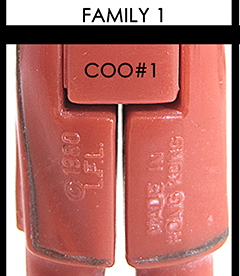 At this time, I haven't started a detailed guide showing the subtle differences between each mold for this COO Family, so for now, let us look at the key features for each of the major variations of this Family/COO number in a little more detail without focusing on the subtle mold's stamp variations alone. 1A: CREW NECK - AKA "GREEN NECK"
Green Neck is a nickname given to this figure. This figure is actually a transformant (chemical reaction changed the appearance) of the Flesh Neck 1B. It is not a true variation. It is also referred to "Grey Neck", "Tarnished Neck" and more. 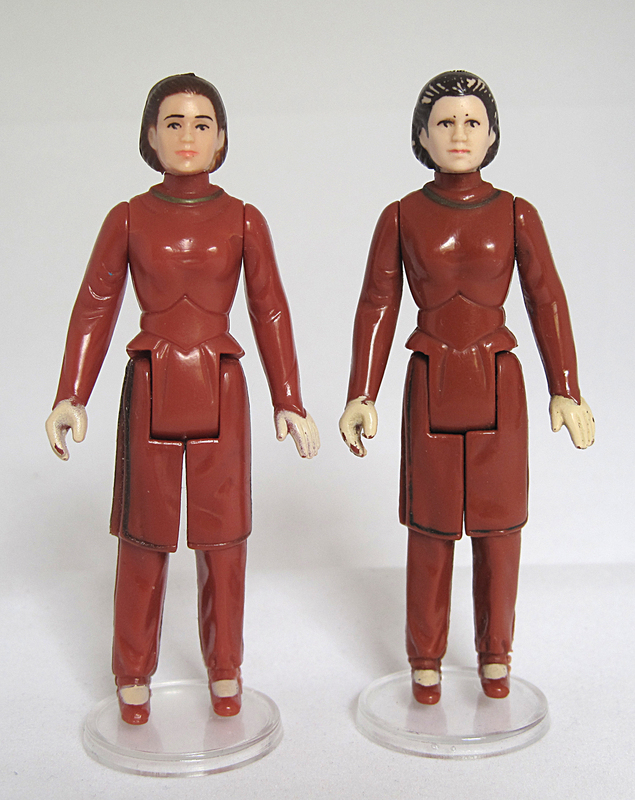 The figure most accurately can be called a crew neck figure based on the type of neck line the figure has. A crew neck is the most movie screen accurate. However, this variation, the "Green Neck", actually started life with her neck completely painted in gold then a layer of flesh tone paint was applied over top of the gold, leaving only the necklace area with the gold paint visible. The problem with this combination of paint was that the gold paint reacted poorly with the flesh paint layer causing a tarnishing effect.This tarnishing effect caused the Gold paint to turn a shade of green, grey or charcoal much like you would see with real metal objects left untouched over time. The most logical explanation to the two layers of paint was an initial factory error where they painted the neck completely in gold which was just a waste of paint. 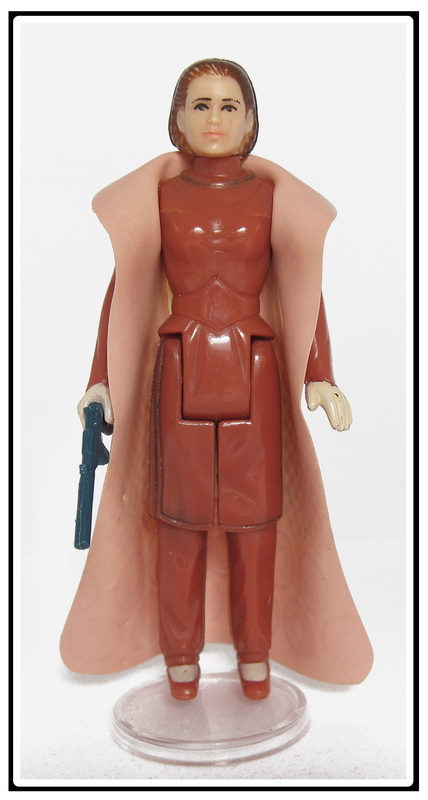 Most commonly, the Green color or even grey color is what you will see for this figure. Finding a Gold Neck that didn't have the flesh paint applied over the gold is possible but near impossible. These 'Gold Necks' are to be treated as factory errors where QC missed a few figures on the line that did not get the flesh paint applied. The 'Gold Neck' was never supposed to have been produced this way. NOTE: Even though some figures didn't have the flesh paint applied over the gold in these figures, the gold paint still could have discolored over time and turned a shade of green (similar to copper green - thanks Wolff!) as well. 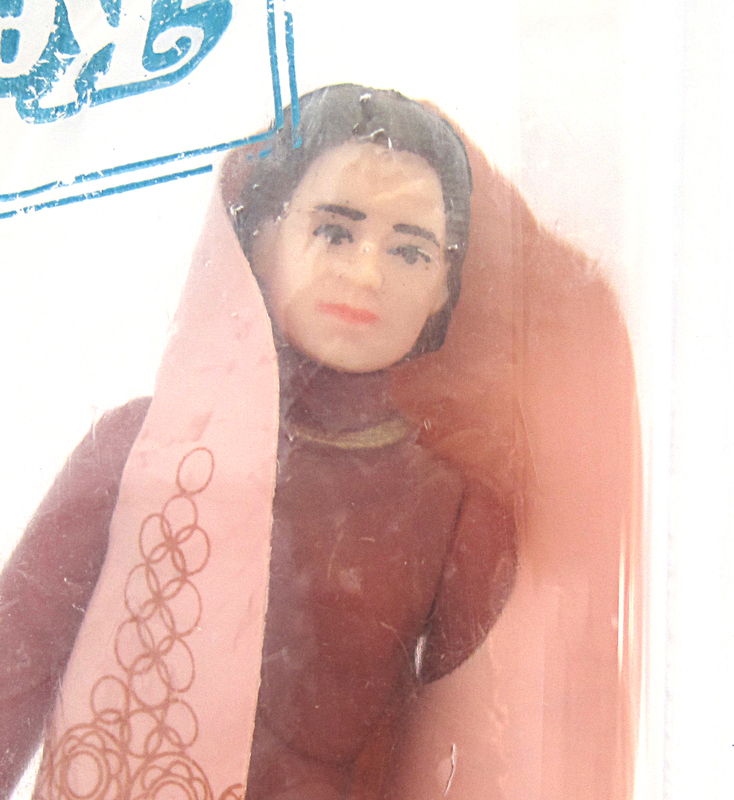 I have only seen one true Gold Neck factory error in pictures. This one was part of TIG and RS member olisuds' collection, . Click the image to see a larger shot of her. 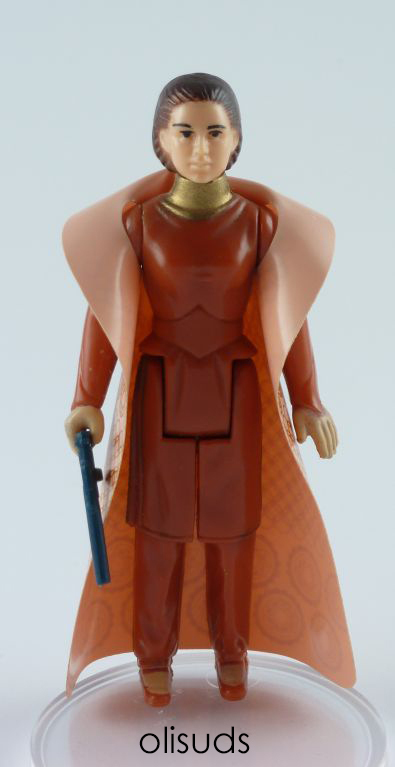 Although it is a factory error, I think it looks fantastic and I will be hunting one down to add one to my collection. 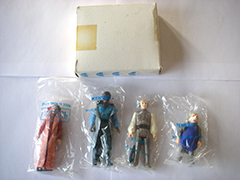 US Kenner ESB 31B & 32B backs and possibly more but as you will see, this figure changed quickly to fix the paint issues. 1B: CREW NECK - AKA "FLESH NECK"
This is the intended variation of this figure. This variation is identical to the Green Neck except it appears that the Gold Paint was either not applied underneath or the chemical reaction did not take place leaving the flesh paint as it was supposed to have been produced. Again, this is the variant and the 1A Green Necks are transformants of this figure. This is much rarer than a Green Neck from what I have seen. Since this is the way it was supposed to have been produced and how so few didn't tarnish, finding a good example now is much harder to obtain. This figure intrigues me a bit. 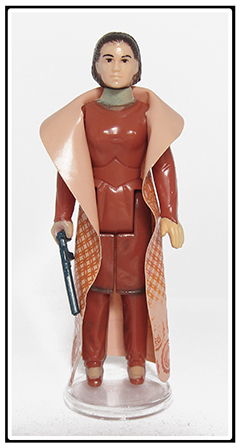 It seems to have had a short run, most likely after the 1F: 'Lil Pochy/Pretty Faced' figures run before being re-tooled into the Raised Bar China version. 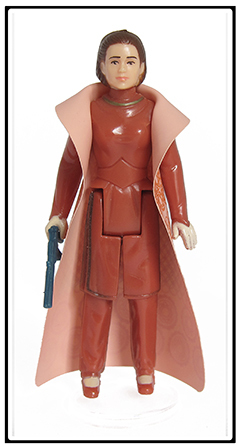 The face is a lot nicer looking than the Flesh or Green Necks and almost as nice as the 1F: 'Lil Pochy/Pretty Faced' figure below. It appears this mold had some problems with the head at some point having excess flashing as 3 of the 4 I have all show a lot of trim marks along the seam of her head. I have found a few examples in some European collections (Wolff & Lee M, to name 2) and the few I have in my collection came out of Germany and England. Here is another variant of her with thick blackeyes this time. 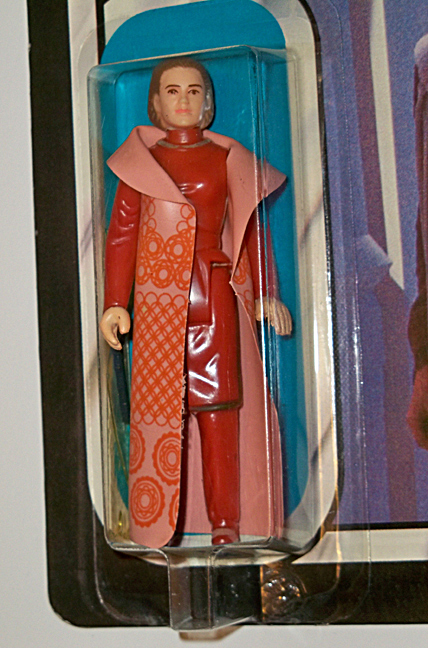 This one has a lot of trim marks as mentioned above which can make this figure look different when looking at her. This specific example came out of England. Here is a picture showing the trim marks on the one above. At least in the US, she seems uncommon to rare. I have only confirmed 6 for sale in nearly a year on all the usual places and all were in either Germany or England. And also carded on General Mills 45 Back (no English tesxt on reverse) (See Here) Please see the 'Packaging' section for more information and possible sightings. This figure can be found inside the very rare ESB-A baggies from 1982 inside the JC Penney - 4 Pack [655-1659]. Thanks to Frank M (frunkstar) for the following images showing her baggie and the 4 pack! Great stuff! At least in the case with Franks and my examples she is the black eyed version. 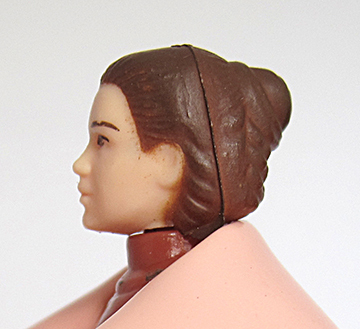 Here is a closeup of the head from my baggie. 1D: TURTLE NECK - LILI LEDY/PALITOY "BLONDE" AKA "LIGHT BROWN HAIR"
This variation was only recently confirmed as a Lili Ledy released figure. 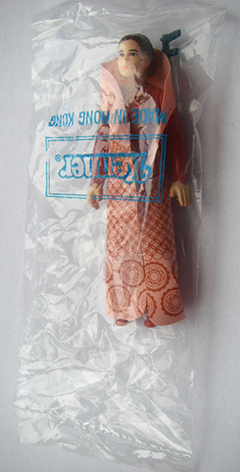 I say "released" and not produced since there is a lot of speculation regarding the early Lili Ledy figures and how they were not produced in Mexico, but rather imported as a test run to see if the market was viable for Lili Ledy to invest in producing their own figures. 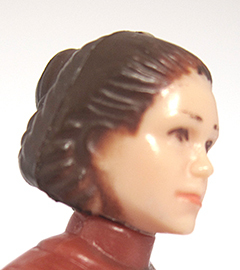 If the test market theory is accurate, it is safe to say that Lili Ledy obviously started producing figures of their own. 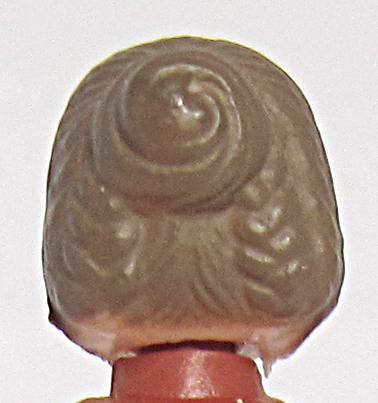 Wolff was among the first to identify this figure as a Lili Ledy figure. Wolff and Horatio (OZIO) both have written about this figure. Here is Wolff's information and here is Horatio's description. 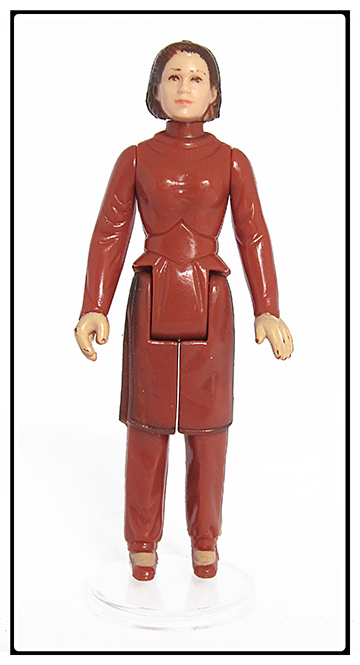 Up until late in 2013, this figure was only mentioned to be solely a Lili Ledy figure. 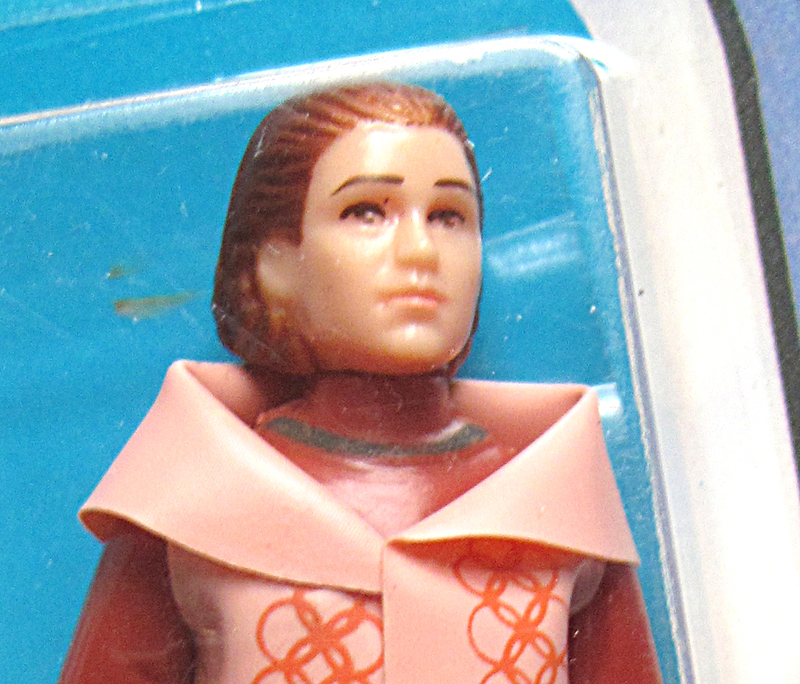 The figure shown in the Palitoy 30B has black eyes where the loose Ledy example has brown eyes. Below is a loose Palioty example with brown eyes. 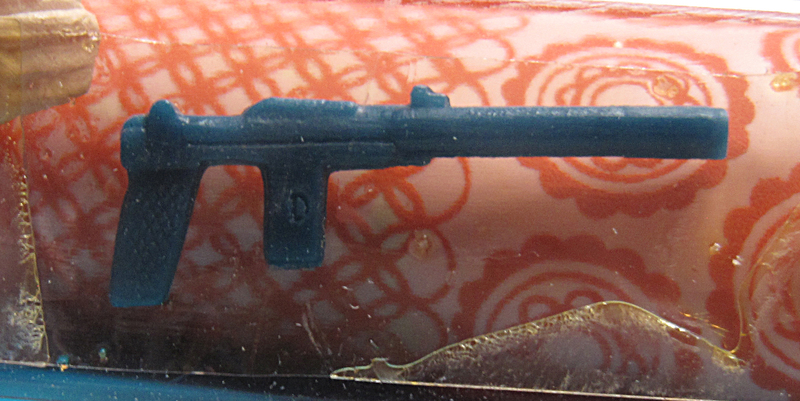 This figure also has a fragile body where cracks can form on the front and/or back near the arms. 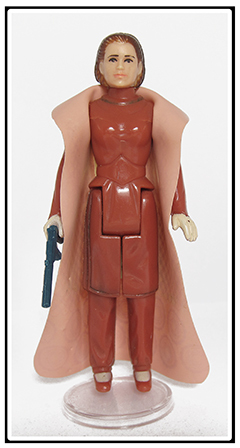 I am convinced this figure originally came with the V3 Blue blaster based on many previous sales I have seen on forums and ebay, plus the Palitoy example and other examples from this very specific COO mold which all should have originated from the same factory (Kader). 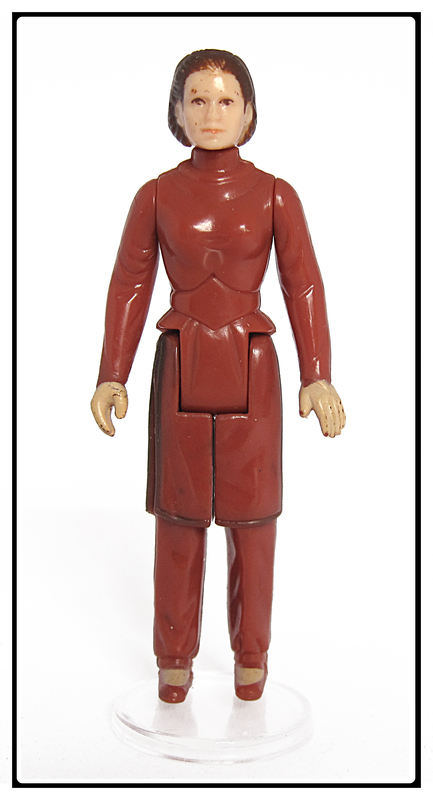 Although this figure was thought ot be a Lili Ledy figure only, even with the newly confirmed addition of the Palitoy counterpart, this figure is still extremely hard to find. At this point, I would have to say that, in comparison, the Ledy is easier to come by and the Palitoy is much harder to find. Finding one complete with original cape and blaster is even harder loose and then factor in condition and you have a long hunt to find one! Either way, this is one of the hardest to find and most sought out variations. Here is a loose Palitoy version which is identical to the Lili Ledy version. 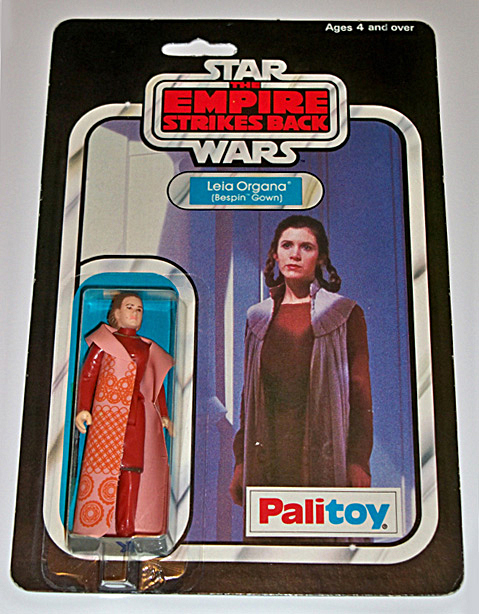 The Palitoy version was released on the ESB 30B. This figure came from an UK childhood collection and came with the V3 Blue blaster which I am convinced is the proper blaster for this figure (and Ledy). 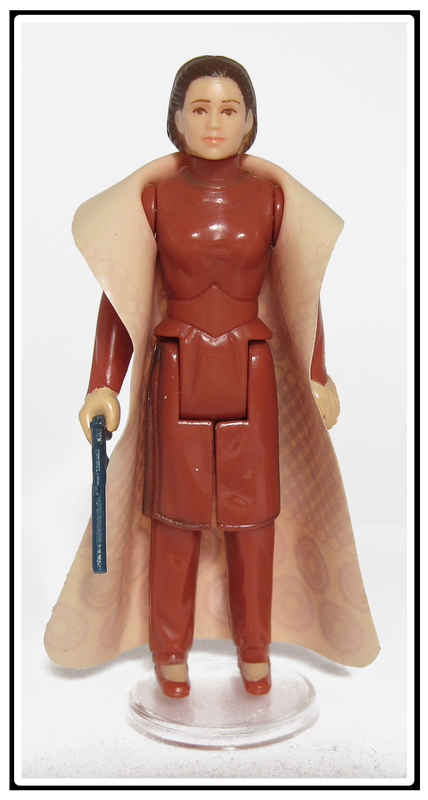 This figure also came with the V2B cape which I am convinced is the one of the two possible proper capes (the other is V2A) for this figure (and Ledy). 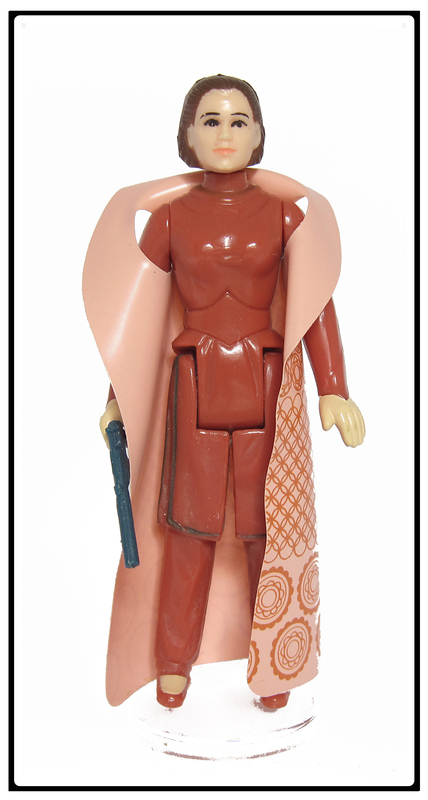 The Lili Ledy version would have been released on the 'El Imperio Contraataca' 10 Backs. 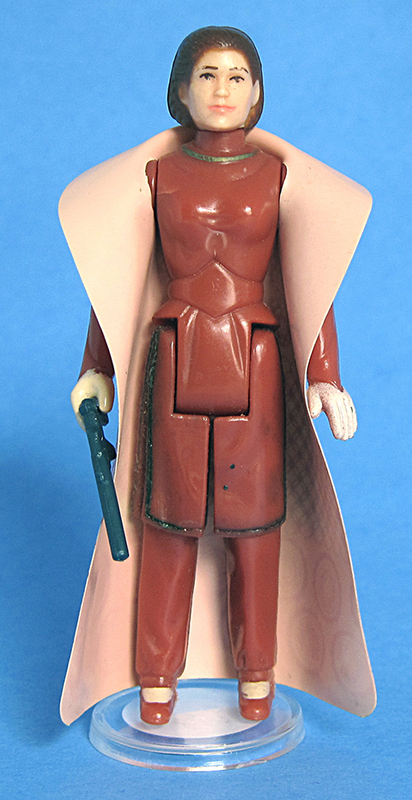 I have yet to find photographs of the Lili Ledy blonde carded in anyone's collection to date. These images come coutesy of BruceW's collection. Check out his limelight HERE. 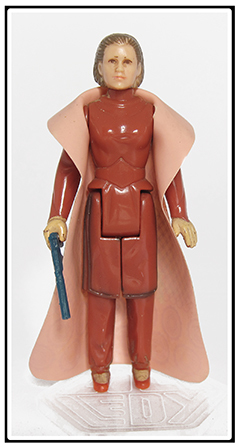 The POCH figure shares the same mold as the blonde/light brown haired Lili Ledy & Palitoy version, just with a different paint scheme. I frequently call them sisters or cousins since they share the same mold. I still cannot confirm the existence of a true Kenner version of this variant. Her hair paint color can be found in a reddish/brown color or a brownish/red color. Typically, the reddish/brown color is the most commonly found. 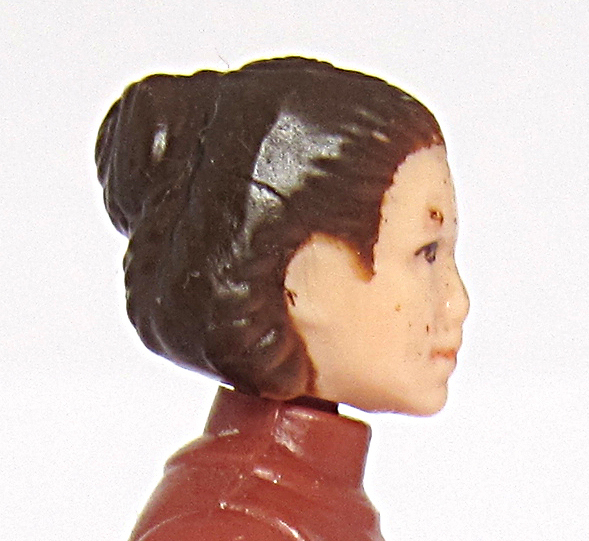 For the reddish/brown hair, the red tones are easiest to see near the edges of her hair lines since the paint application is usually a little under-sprayed which shows the true paint color best. The under-spray is not always the case, but a little more common to find. It is also easier to see in very bright and/or direct light sources. 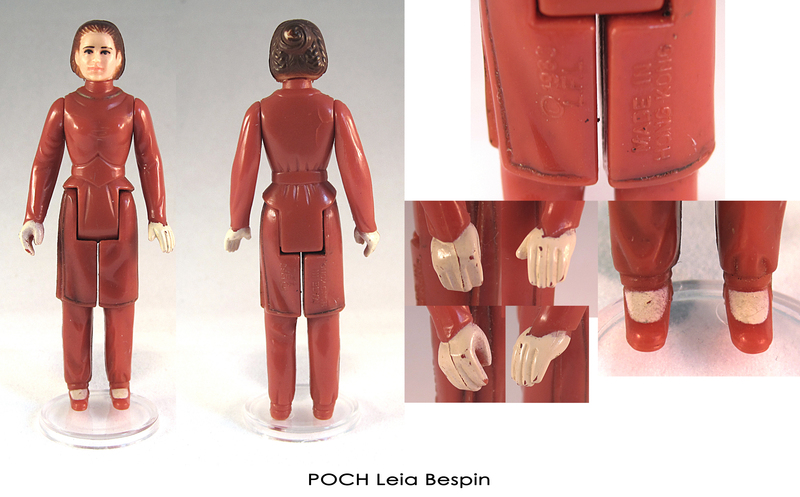 Since this figure is a POCH, it also has the typical pale/light/white colored hands and feet. 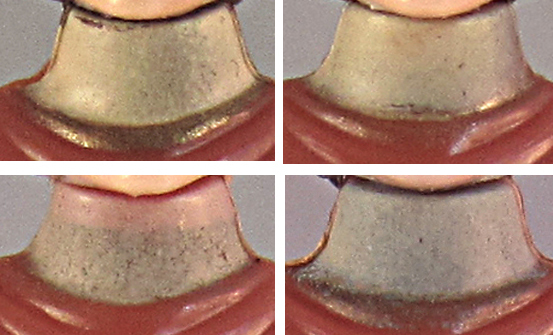 This figure also has a fragile body where cracks can form on the front and/or back near the arms. This figure is very hard to come by loose and next to impossible carded. This is one of the hardest to find and most sought out variations. 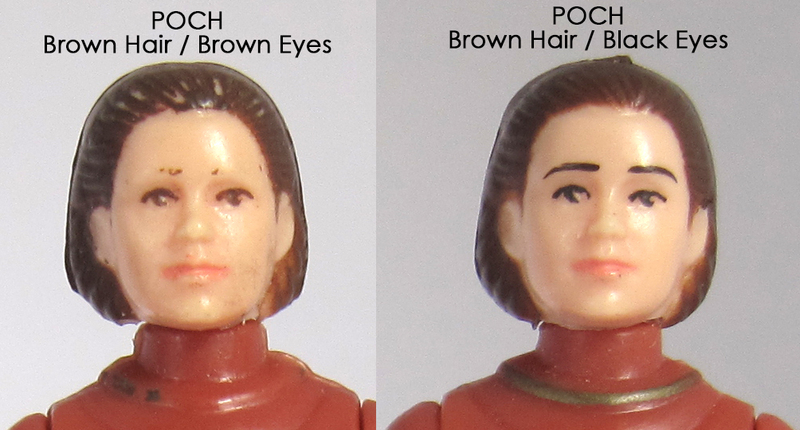 The main variation you will mostly like see and find for the POCH figure is the main one pictured and discussed earlier with a bit of under-spray which shows off her reddish/brown hair the best along with black eyes. Heree is another red hair/brown eyes. 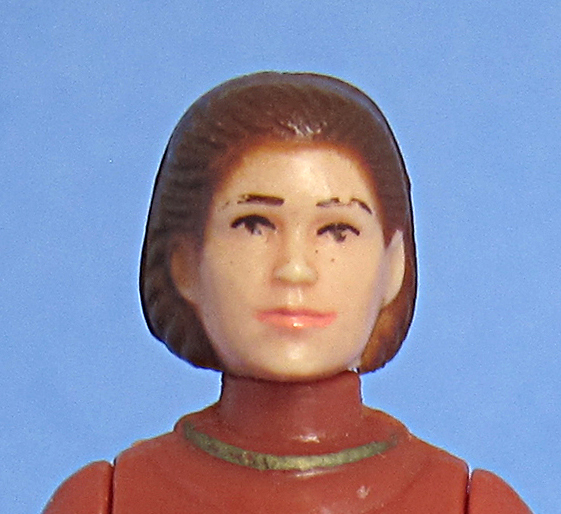 This one has massive over spray to the hair, the left eye was mis-applied (lower) and the lipstick was over sprayed as well. Her left hand is also under sprayed making the right hand appear darker. This is not a mixed up figure, just differences in the amount of paint applied. Here is a picture of the brown hair with brown eyes which comes from Lee M's collection. To date, I have only heard of and seen two of these carded examples and both can be seen on the Star Wars Spanish Stuff website. Check out that website to see the two carded examples. The picture on the left on the SWSS website went up for sale on ebay in mid 2013 for over $5000 if I recall!!!! What an awesome piece! 1F: TURTLE NECK - AKA "PRETTY FACED" AKA "Lil' POCHY"
I call this figure Lil' POCHY because she shares the same mold as both the blonde Lili Ledy and POCH figures. 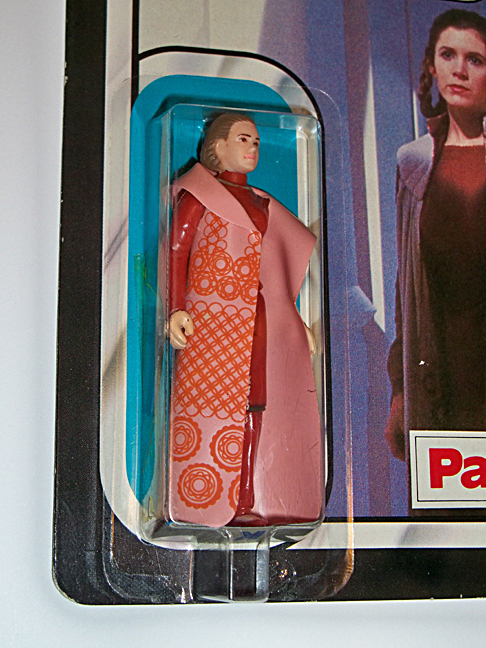 Until I can prove her original company (example: Palitoy), I refer to her as "Lil' POCHY" or "Pretty Faced". Lil' POCHY is just my nickname for her in the meantime. This figure is another sister to Lili Ledy and POCH. 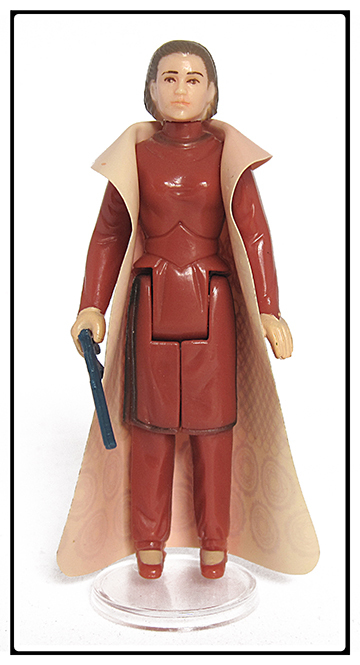 She has that awesome "pretty face" which I think is by far the best sculpt of her around. The triplets, for a lack of a better phrase, are the center piece of my loose collection. Her hair paint color is a reddish/brown color that depending on how thick it was applied can be seen better in undersprayed areas similar to the POCH figure. Her eyes are mainly found with a light brown paint color. If you click the image below to view a much larger version, you can see the slightly different hair and eye paint applications. 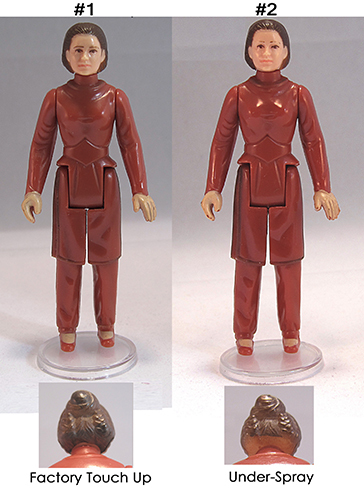 NOTE: The factory touch up on the left figure shows extra brown paint applied to the back of the bun and the lower part of her neck. This figure seems to be very hard to find and when found mainly in Germany with the scarce sighting in England. Since this figure is a sister to the Lili Ledy blonde and POCH, she is in my opinion one of the more desirable variants. Even when found, finding one with good eyebrows and hair paint condition is difficult to say the least. 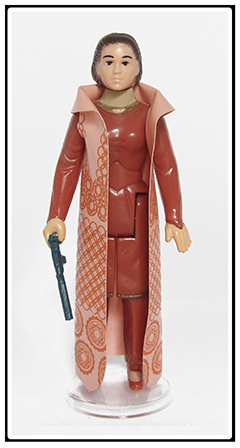 I think over time, she will become a highly sought after variant. 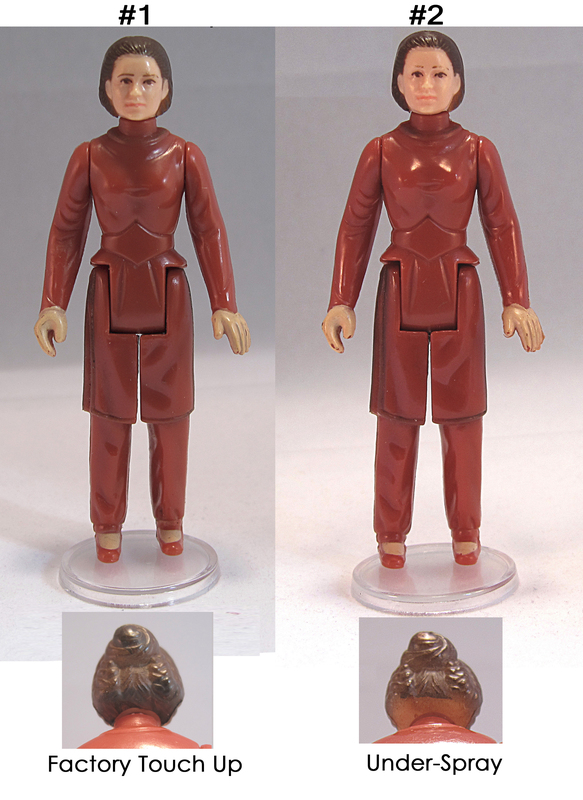 As shown above in the hair paint and eye paint comparison, here is the other figure mentioned. 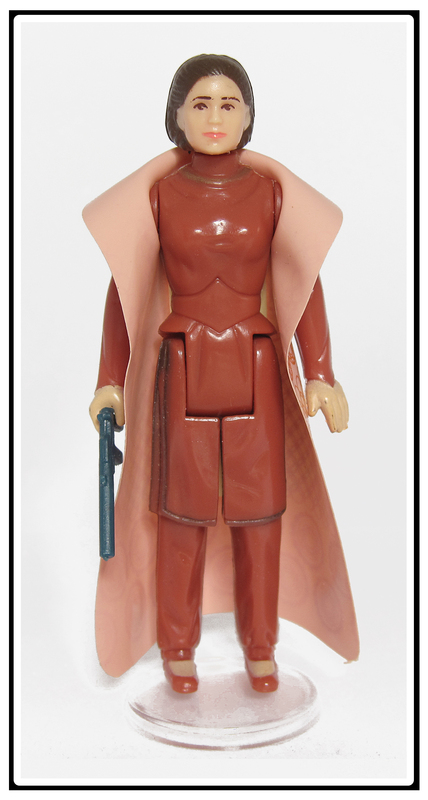 So far I have confirmed a very bright and vibrant red haired version (like her POCH sister) on Kenner ESB 41D cards from the Kader Industries factory. See 1F RH: Turtle Neck - Pretty Faced - AKA Lil' Pochy Red Hair below for more information. 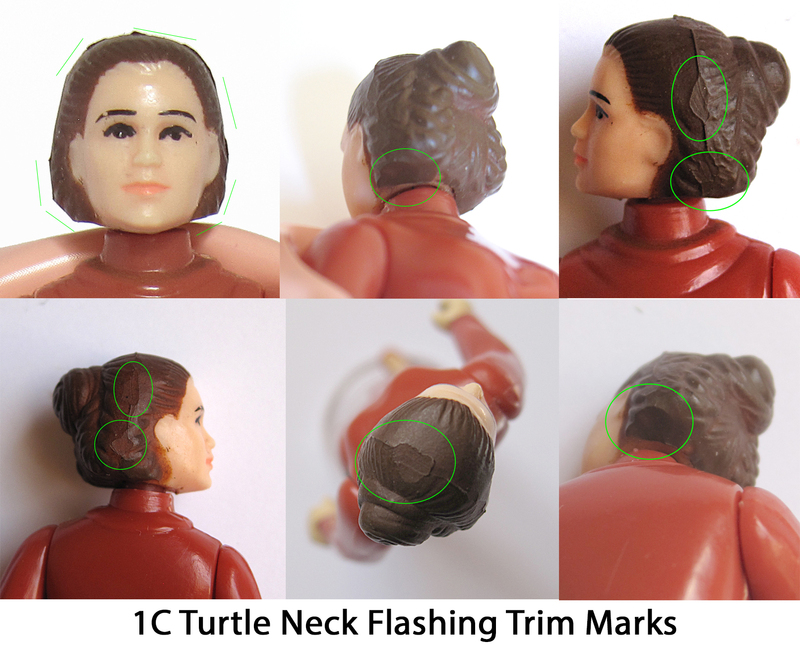 NOTE:This figure is a variation of the 1F: Turtle Neck - Pretty Faced - AKA Lil' Pochy Brown Hair but I find her interesting enough that I believe she deserved her own write-up. This figure snuck up on me. I had no difinitive proof that a Red Haired version of this COO existed outside the POCH red haired figure. First confirmation Dec. 2013. 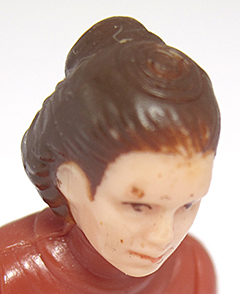 This figure is very interesting in that her hair is very red similar to the POCH red haired but the red tones can be seen much easier in any light or angle. I will be putting together a more complete timeline of this COO later, but my basic thought is this figure came after the blonde (1D) and at pretty much the same time as the POCH red haired (1E) before eventually becoming the brown haired variant (1F). 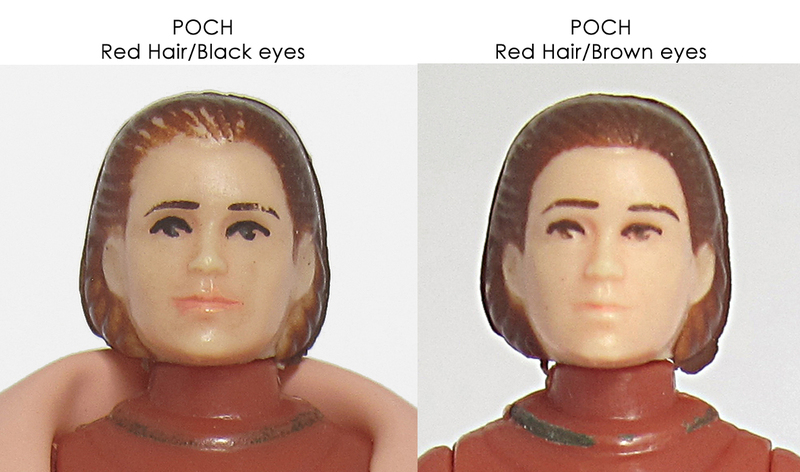 Here are some examples of this variant with red tones in the hair much more like her POCH sister. This one is a short shot or experienced excess shrinkage during cooling where her nose and chin do not protrude out as far as they should. This figure is somewhat rare. I have yet to spot a true loose red hair. The two loose ones above only show little red tones but far from my carded 41D example but I include them here since they do exhibit the redness. 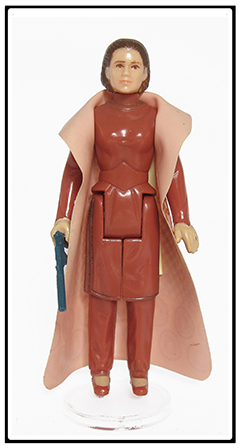 She can be found carded on Kenner 41D (Kader Industries Factory Coded) backs and Harbert stickered 41 backs. A transformant, simply put, is anything that would alter the physical appearance of a figure or accessory causing it to no longer match it's original produced state.